So you’ve made the big leap and planned to have an extra special bird this Thanksgiving. 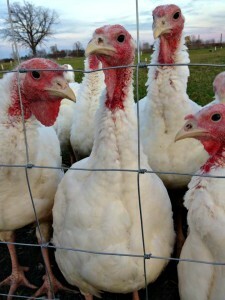 Your heritage breed or pasture raised turkeys are mere weeks away from butcher or perhaps you ordered one from a local farm or supplier. Either way, this year’s turkey is an investment that you expect to pay dividends in the form of a super delicious, epicly juicy, showstopping centerpiece for your Thanksgiving dinner. 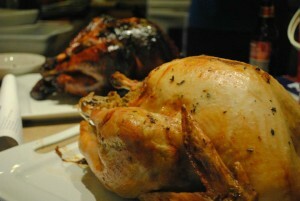 Well put down your turkey baster, because we have a few tips to help you ensure a plump, flavorful bird for your table! As they are generally raised outdoors, pastured and heritage breed turkeys tend to be leaner than their conventional cousins. Less fat means a narrower window between a fully cooked Norman Rockwell turkey and a ruined sahara desert of a bird. The temperature at which the turkey is removed from the oven is key. According to the USDA “A whole turkey is safe when cooked to a minimum internal temperature of 165 °F as measured with a food thermometer. Check the internal temperature in the innermost part of the thigh and wing and the thickest part of the breast.” Those concerned with taste over safety (read: reckless foodies who eat rare steaks and runny eggs) suggest taking the bird out when the thickest part of the thigh reaches 155 to 160 degrees. Tenting the turkey in tin foil and allowing it to rest for 30 minutes will allow the temperature to coast up as much as 5 degrees. A lower temperature translates into juicier meat, but may increase the chance that any salmonella will not be entirely eradicated. This is especially true if you are stuffing the bird, which you should g ive up entirely. If you don’t believe me, ask Alton Brown who said in his book Good Eats: The Early Years “When it comes to turkey, Stuffing Is Evil. That’s because stuffing goes into the middle of the bird and is extremely porous. That means that as the turkey around it cooks, juices that may contain salmonella bacteria soak into the stuffing, which then must be cooked to a minimum of 165°F in order to be safe. Getting the stuffing to this temperature usually means overcooking the turkey.” The bottom line is go ahead and stuff your expensive, lovingly raised turkey but you may just be turning it to shoe leather. If the idea of ‘undercooking’ a turkey is frightening, or if you love delicious things, consider adding fat to the turkey before cooking. Herbed but ter rubbed under the skin of the breast will not only give you a bit of a cook time safeguard, but it makes for pretty amazing skin and gravy, too. It’s hard to go wrong with some sage, thyme, and soft roasted garlic flavored dairy fat. Alternatively, wrapping the breast portion of the turkey in bacon (think fatty bacon or fat back rather than lean, meatier bacon strips) is an extremely effective way to make a moist delicious bird and a scrummy gravy. Just make sure to remove the bacon after an hour or two of cooking so the skin gets a chance to crisp. It may not be entirely traditional, but if it was good enough for Julia Child it should be good enough for anybody! Finally, or perhaps first off as it is the first decision you should make about your bird prep, is the brine. 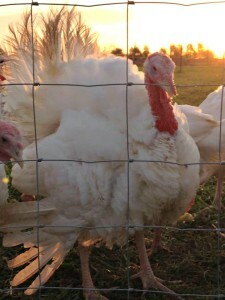 Pastured and heritage turkeys, being a bit leaner and not quite as tender, will benefit from prolonged exposure to salt through either a wet or dry brine. If you need to know the science and see the proof, take a look at this Serious Eats blog post. 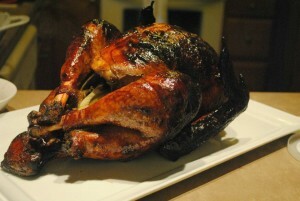 Or just take my word for it; when it comes to turkey brined is best. A wet brine will yield the juiciest turkey and can be a great way to flavor a bird with anything from soy sauce to herbs, but the process is a messy one. Not to mention, floating a turkey in all of that water dilutes the turkey flavor a bit. A dry brine will yield a very slightly less juicy bird with more concentrated turkey flavor and less hassle. Either way, the salt in the brine will act to seal in moisture and tenderize the meat. Just remember to brine your thawed bird at least overnight and up to 20 hours. Thoroughly rinse the turkey and pat it very dry before it heads for the oven or the skin will be salty and less likely to crisp (for truly crispy skin, skip the basting as well. Moisture is the enemy of crispiness afterall). Whether you choose to dry or wet brine, bacon or butter, cook or coast, we hope these suggestions will help make your family’s heritage breed or pasture raised bird the Best. Turkey. Yet. And in the immortal words of Tante Marie “Just put the turkey in the oven” and maybe baste yourself liberally with wine while it cooks. ← Purely Poultry is now hiring an Mailroom / Customer Service Representative to work in our new Appleton office!